Today as part of International Day of People with Disability (IDPwD), the Power 100 List was announced with Euan among Britain’s most influential disabled people! Power 100 highlights the successes of disabled people and the final members shortlisted by the public were judged by a panel chaired by Ade Adepitan MBE, wheelchair basketball player and television presenter among those selected in the final 100. Number one on this year’s list was Baroness Grey-Thompson DBE, DL, the legendary wheelchair racer and television presenter with eleven gold Paralympic medals. Euan was recognised for his work co-founding The Euan MacDonald Centre for Motor Neurone Disease Research and his role in establishing The Voicebank Study, before going on to co-found Euan’s Guide with his sister. 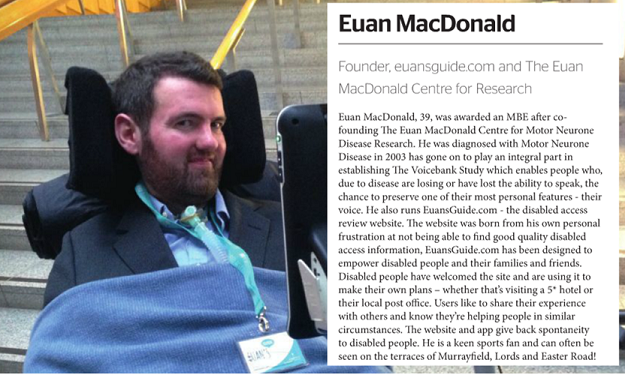 Since appearing on the first Power 100 List in 2015, Euan has continued to support MND research and develop Euan’s Guide, and the charity now sponsors Disabled Access Day, with the highly anticipated event to be held March 12th 2016.